ATF 2015: MAKING IT was held at the Seymour Centre in Sydney from 20-23 January 2015, as part of the 2015 Sydney Festival. 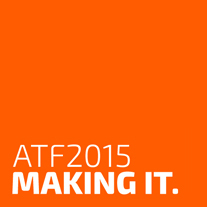 Curated by David Williams, ATF 2015 focussed on how we are “making it” in theatre in Australia. Over four days, we looked at practice – what, how and why we are making; and who we are making theatre with and for. We also looked at how we “make it” in theatre – our pathways and professional journeys. ATF 2015 brought together over 300 delegates from independent practice, festivals, small and major organisations. We wanted this forum to define a new way for us to talk about theatre in Australia. It formed a conversation with all corners of the sector – our writers, makers, designers and our elders – to ensure that we acknowledge our past in looking to the future. Through a broad range of keynote speeches, panel discussions, workshops and activities, we shared some radical ideas about how theatre can and should make a difference. For more information regarding delegate categories and fees, visit the Registration page.